What causes Nasal Airway Obstruction? Lateral (side) wall: The upper/lower cartilage in the side of your nose can flex or collapse inward when you breathe. Septum: The cartilage wall between the nostrils can bend and block the nasal passage. Turbinates: Ridges of bone and tissue inside your nose can limit airflow when enlarged. Is lateral wall collapse contributing to my Nasal Airway Obstruction? Your doctor can determine the cause of your NAO. 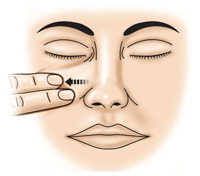 If your symptoms improve when you wear nasal strips, or when you perform a simple breathing test called the Cottle Maneuver (see illustration to the right), you may benefit from support for your lateral wall. The LATERA implant is a minimally invasive option for supporting upper and lower lateral wall cartilage in your nose. The LATERA Absorbable Nasal Implant is used to support upper and lower lateral cartilage in your nose. It is placed inside the nasal wall in a minimally invasive way. Supporting the cartilage in this manner may reduce nasal airway obstruction symptoms and help patients breathe better. The LATERA implant is made of a material that absorbs over a period of approximately 18 months, so can deliver support without limiting future treatment options. What have patients experienced with the LATERA implant? Other risks related to the LATERA implant include: discomfort, infection, reaction to material, and device retrieval. Talk to your doctor about your nasal obstruction to find out if LATERA could be right for you.